Return home for Corsham Court contact details, opening times, admission charges and disabled access arrangements. 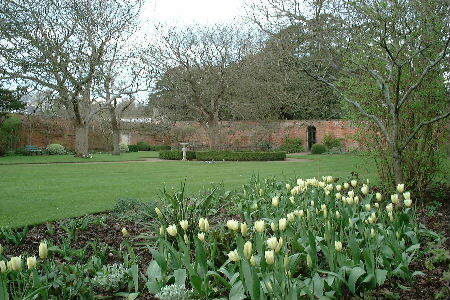 The Garden Diary is a monthly account of what to look out for in the Grounds of Corsham Court. Each bulletin includes a resume of seasonal work in progress. Click here to read this month's edition. Please note that some of the larger trees in the garden are very old and prone to suddenly drop heavy branches from time to time. Visitors should not walk beneath them and maintain vigilence at all times. Click here to visit the N.G.S. web site. On acquiring Corsham House (as it was then known) in 1745, Paul Methuen set about not only re-modelling his mansion but also its setting. This affected the deer park (subsequently extended to the 350 acres comprising Corsham Park today) and the grounds nearer the house maintained as formal gardens. At this time, three avenues of elm trees radiated from the house to the north, south and east respectively. In addition there were a series of pools (or stew ponds) on the north side of the house and to the north of the east avenue. In 1760, Paul Methuen commissioned Lancelot "Capability" Brown to extend Corsham Court and also devise a landscaping proposal. Brown was an advocate of the Landscape Movement so prevalent during the Eighteenth Century. His creation of pastrol settings, through the "naturalisation" of his client's grounds, is much in evidence countrywide today. Brown and his followers were responsible for sweeping aside the vast but precise ornamental layouts, fashioned on continental gardens, by earlier generations. the provision of an orangery in the gardens (since demolished). Of the three architectural works designed by Brown for the gardens, it is only the Bath House (right) that stands testimony to his commission. It was later re-modelled by Nash, who added further gothic adornment to the picturesque building. The cold bath is sunk into the arcaded ground floor and a flight of steps leads to a dressing room (not open to the public) above. 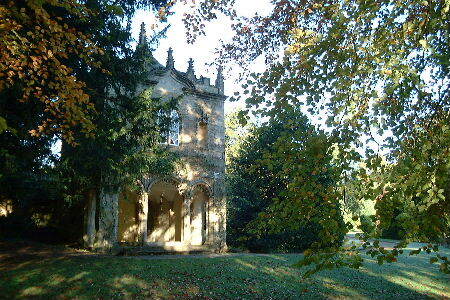 The ogee shaped side archways, the windows, the gothic niches and the pinnacles of the roof remain from Brown's original pavilion. The formal gardens extend (approx. 17 acres) primarily to the south (front) and north (rear) of the house with long herbacious borders and feature high walls with climbers, a lily pond, box hedging and some statuary. They have a distinctively Nineteenth Century feel which is not surprising as the wife of the First Lord Methuen, Lady Jane Dorothea Methuen (nee Mildmay) was a keen gardener and came to Corsham in 1810. The Victorian influence of later years introduced species and themes most closely associated with that era, although thankfully without detriment to the layouts and plantings of the previous century. 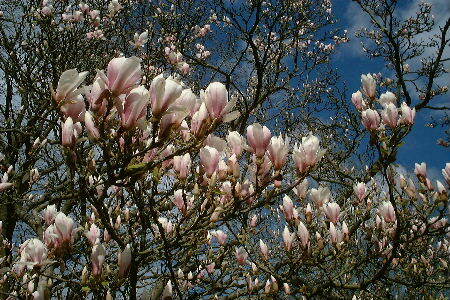 There are a number of mature magnolias which, together with other spring blossom, provide spectacle early in the year, when a succession of flowering bulbs carpet the informal glades between trees surviving from the times of Brown and Repton. Some of the herbacious borders are defined by clipped box hedging bordering paths permeating the far corner of the former rose garden, for which restoration plans are afoot. Throughout the season, recent plantings provide bright and colourful contrast to the shaded and intimate areas beneath the tree canopy. There is further an eighteen acre young arboretum with an Elizabethan conduit house, from where the town once drew its water.